I like weather appropriate photos and this one certainly qualifies as the Sierra Nevada continues to get pounded by snowstorms this week. The roads to Yosemite were closed for a time and Mammoth Mountain has set a snowfall record with 589 inches this ski season. The above photo was taken in Jan. 2010 at Dutch Flat in Northern California — the route used to cross Donner Pass on the way to Truckee and Reno. 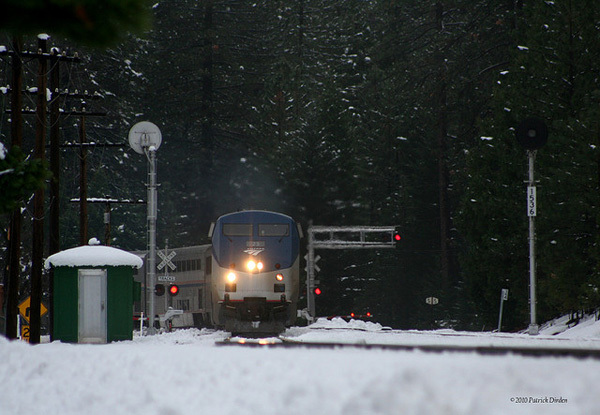 It’s really a shame Amtrak doesn’t run more trains from the Bay Area and Sacramento to Truckee, the town nearest the Lake Tahoe ski resorts (in Amtrak’s defense, this is also a heavily used freight corridor). According to the Amtrak schedule, there is just one train today — other options involve taking the Amtrak bus, meaning you get to sit on I-80 in traffic along with everyone else.